Lucky Louie is HBO’s first-ever multi-camera comedy series, which takes a fresh and funny look into blue-collar domestic life. 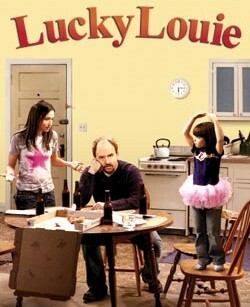 Bringing an honest and unadulterated approach to the classic half-hour sitcom, Lucky Louie focuses on the challenges of marriage and family through the story of a young couple who are just barely getting by. Louis C.K. stars as Louie, a part-time mechanic at a muffler shop, who spends most of his time at home taking care of his four-year-old daughter Lucy while his wife Kim, the real breadwinner, works as a full-time nurse. This untraditional arrangement can be difficult at times, as Louie is never content with the role of caregiver (despite having no skills or ambition to offer his family or society), and Kim can never quite let go of controlling, supervising and criticizing Louie’s shoddy stay-at-home work. But they always stick it out in the end, because somewhere under all that muck they love each other… plus, they have no choice.